The Alfa Romeo Giulia Quadrifoglio midsize sedan will make its debut at 11:25 a.m., followed by the Fiat 124 Spider roadster at 1 p.m.
Fiat Chrysler Automobiles NV brought a bit of Italy to the 2015 Los Angeles Auto Show. The automaker on Wednesday unveiled sporty Italian-built cars from Alfa Romeo and Fiat – two of Italy's most iconic brands aside from Ferrari. The high-performance Alfa Romeo Giulia Quadrifoglio midsize sedan made its North American debut at 11:25 a.m., followed by the global unveiling of the Fiat 124 Spider roadster at 1 p.m.
Watch executives from both brands unveil the vehicles below. 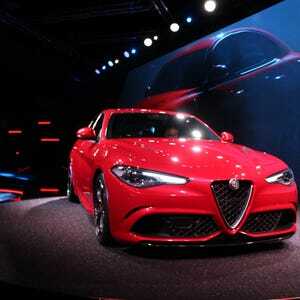 The high-performance Giulia Quadrifoglio originally debuted in Italy in June for the brand's 105th anniversary. The sedan delivers class-leading 505 horsepower and accelerates from 0-60 in 3.8 Seconds. It is expected to arrive in U.S. showrooms in the second-quarter of 2016 starting at about $70,000. The resurrected 124 Spider is expected at U.S. dealerships next summer — 50 years after the original car debuted in Italy. The roadster will be powered by Fiat Chrysler's turbocharged 1.4-liter MultiAir engine capable of 160 horsepower and 184 pound-feet of torque.